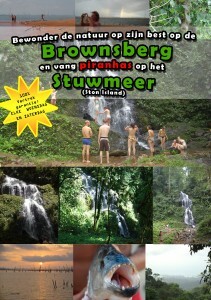 Booking of this tour can be online at www.brownsberg-suriname.com or at one of our sales locations! Now head inland to discover the impressive Brownsberg. Admire nature at its best and catch piranhas on the lake with local fishermen. Brownsberg is the most popular destination in the interior. During the trip to the Brownsberg there is a rich diversity of flora and fauna. From centimeters small palm trees to meters high trees with orchids. In the wild, there is a wide variety of animals. From snakes to frogs to monkeys and pigs. For nature lovers Brownsnberg highly recommended. The trip from Paramaribo is about 110 km long. On the way we pass Indigenous and Maroon villages. The road to the summited is climbed by bus or car. Once on top you can enjoy the beautiful view over the lake. In the evening we leave towards the lake, we will stay in beds. Here you will enjoy trips between excellent canopys, the night extensiveskies and the breathtaking nature. During the trip, we relax in hammocks and swim in the beautiful water. We also go fishing for toekoenari’s (bass type) and piranhas.